Computer Armoires from Brandenberry serve as a storage and work area for your computer and related equipment. 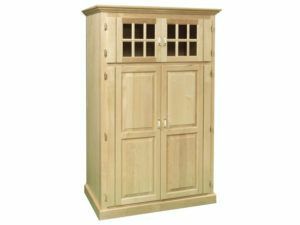 Built by Amish artisans using solid hardwood, our armoires are sturdy and durable. They’re far superior to anything you’d find at traditional furniture or discount stores. 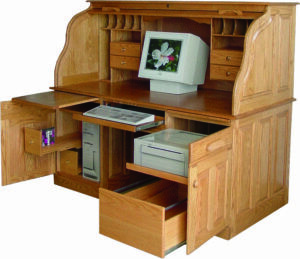 The Traditional Computer Armoire features an efficient work space, beautiful Amish craftsmenship and traditional styling. If you wish to confine all your computer equipment to one place in your home, where you can work or keep everything out of sight, a computer armoire from Brndenberry is ideal. Open the doors, and you’ll notice we include all the stuff needed to set up your high-productivity computer station. For example, you’ll find a keyboard tray on full-extension slides. Plus a full-extension drawer. You’ll also be impressed with the large storage space and the adjustable shelf. Amish cabinetmakers custom-build the computer armoires. And they use solid hardwoods like oak, maple, cherry and hickory. So each computer armoire is built sturdy and durable. Take good care of the unit you buy, and it should last for decades to come. You can order a computer armoire as shown or unfinished. Or, you can ask us to customize it for you. Just tell us your preferences. Like your choice of wood plus the stain/finish. Also, if you have questions, feel free to talk with one of our trained staff. We’ll help you create the office armoire of your dreams.